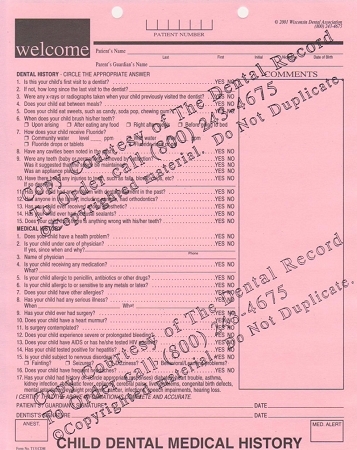 The Child Dental-Medical History form eliminates questions that are not appropriate for young patients. 100 forms per tablet. This form includes sections for recording information that specifically pertains to children, such as the patient's level of cooperation and the oral habits of infants. However, the individual practitioner can change the age requirement to his satisfaction. There is also space for an occlusal exam and for orthodontic referral.